Welcome to the Best Ever Free Tally Course Online. I have tried cover all Basic Concepts of Tally in this course so it will be very easy and FUN for you to learn Tally. In this course you will find 2 things in particular. You can watch the video and then read the post or you can do the opposite of it. It’s your choice. But, do both of them for the best understanding. It is my responsibility to help you learn the Basics of Tally. Once you complete the Basic Course, you will be easily able to operate Tally. I have created this Basic Course in a way that you will know almost everything that a normal business requires in Tally. So, there are chances that you can get a JOB after going through the Basic Course here, if you are looking for one. Once you complete the course, you can take the test and get a certificate if you pass the test. Test will be of Multiple Choice Questions – MCQs. You’ll get an email after the completion of the course on E-mail. Get this Free Tally Course on your Email to receive Certificate! Start learning Tally for free! First thing is to Download and install Tally. In this video tutorial, I have explained how to download and install Tally for FREE so that you can learn Tally hassle free. If you already have Tally installed in your computer then it is always good to check whether it is the latest version or not. You can verify that by watching the tutorial. If the version of Tally that you are using is the latest one then it is perfectly awesome and you can simply skip this tutorial and move ahead to next one. This is the Most Basic Step that you need to do after successfully installing Tally in your computer. This is basic because you CANNOT do anything or try anything unless you create a company in Tally. So it is compulsory to create a company in Tally. It is like creating a client profile for the purpose of accounting. I have explained in detail the creation of a company in Tally in the video. It just takes 5 minutes after you have learned it well. Go ahead and watch it now. It is much essential. 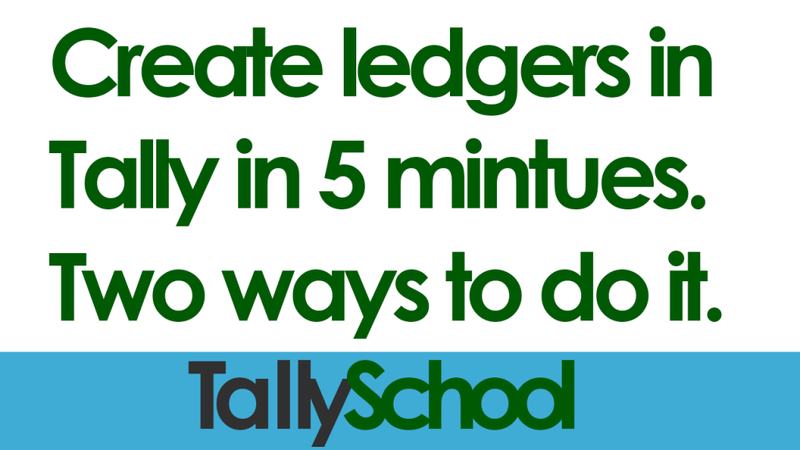 After you have created a company in Tally, it is now time to create ledgers. They are like different accounts that you have in your business or in your own name. For example you have an expense account, a furniture account for Fixed Assets or a Capital Account of your name. These are basically called ledgers in accounting language. They are very easy to create and is one of the building blocks for your learning in Tally. It only takes 5 minutes to create 10-15 ledgers. Yes, trust me! Basic accounting vouchers are Contra, Payment, Receipt and Journal. These vouchers are used to enter basic entries in Tally. For cash and bank there is contra, for payment and receipt there are payment and receipt as well and for adjustment entries there is journal. F4, F5, F6 and F7 are the shortcuts in Tally for passing these entries. See the video tutorial and you will understand it all. 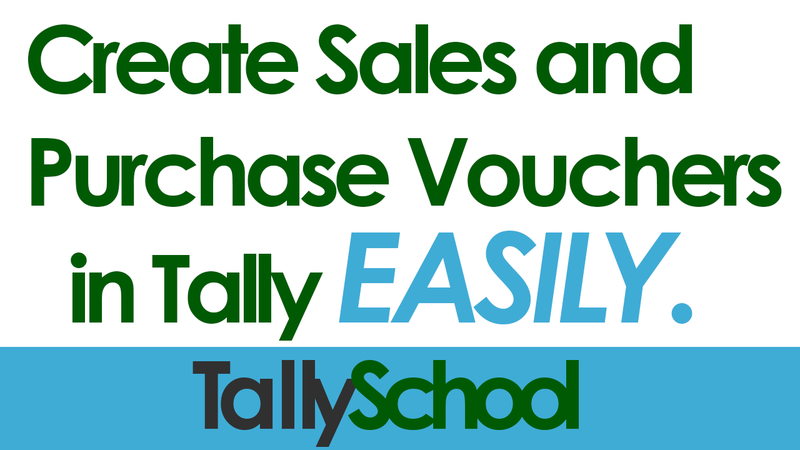 Sales and Purchase Vouchers are very easy to create in Tally. If you want to create Sales or Purchase Invoices, I have that in this video. Sales and Purchase vouchers are nothing but sales and purchase invoices. Read the post and watch the video for crystal clear understanding about purchases and sales in Tally. Easily create Debit and Credit Notes in Tally as Tally has inbuilt feature for that. Debit and Credit Notes are generally used when there are Purchase and Sales Returns in Tally. Every business has some kind of purchase and sales returns and that is where debit and credit notes are used in Tally. 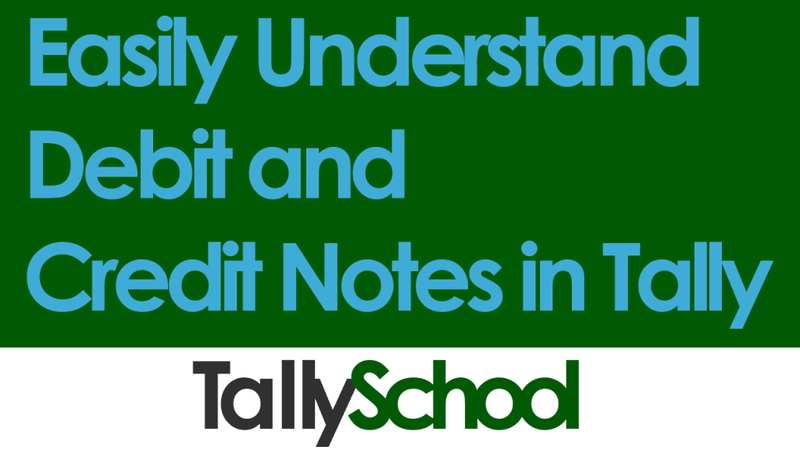 You will also learn the Concept of Debit and Credit Notes in Tally therefore you actually know what that means and then you can easily use them in Tally. Memorandum Vouchers are used when you are NOT sure about the transaction as well as not sure about the amount of the transaction. Post Dated Vouchers are used to create vouchers for future dates. For example, Post Dated Cheques. You can even use BOTH Memorandum and Post Dated Vouchers at the same time. I have explained that in the video and post too. Almost every business has Stocks and you can easily manage stocks in Tally. 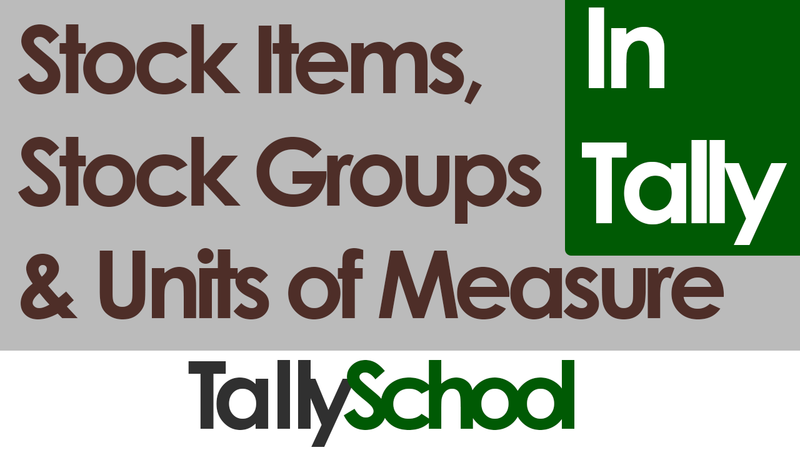 In this video, I have explained, how you can create Stock Items, Stock Groups for better management of stock and Units of Measure. If your business has stocks, I highly recommend you to watch this video. 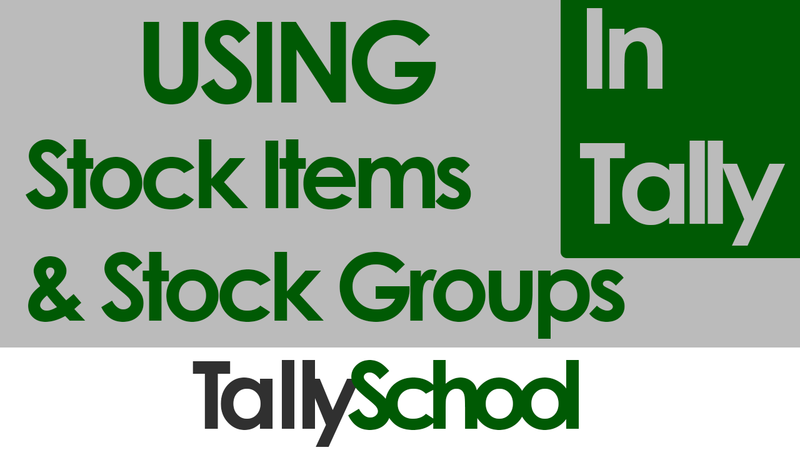 In the previous video, I have explained about creating stock items and stock groups. In this video, I will explain you how you can actually use them. You can use them in many different ways. The most common ones are Purchase Invoice, Sales Invoice, Debit Note and Credit Note. By the way, I’ve explained creating all of the four in the previous videos. 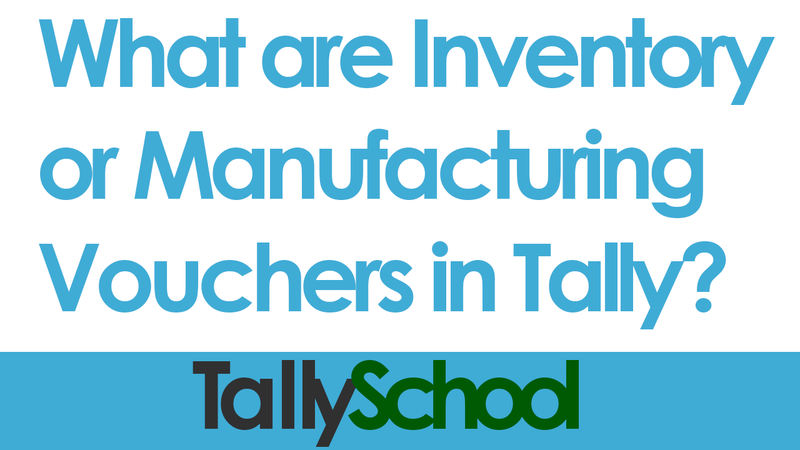 If you want to know about manufacturing entries in Tally, then this video is surely for you. In this video, I have explained how you can pass manufacturing entries in a simple manner with the help of Inventory Vouchers using Stock Journal. You will learn how a Finished Product is made out Raw Materials in Tally. You can also watch the video, if you want to learn about assembling entries because the process is same for assembling entries as well as manufacturing entries. 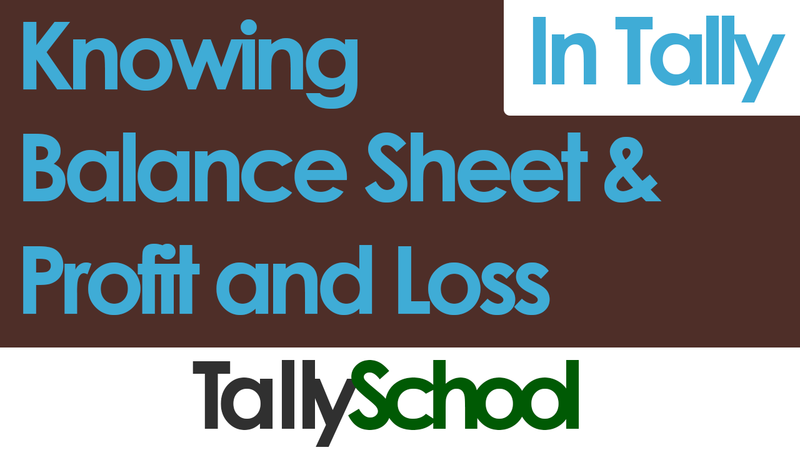 In this video, you will learn how to see Balance Sheet and Profit & Loss Account in Tally. Tally will automatically create Balance Sheet and Profit & Loss Account in Tally on the basis of your entries. Yes, you do NOT have to create them in Tally. Tally creates it for you. I have not written any post because this video doesn’t require writing any post. 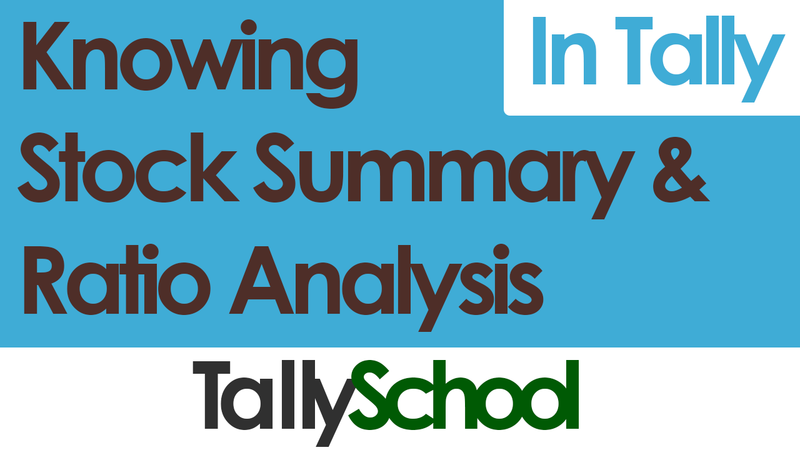 Stock Summary and Ratio Analysis in Tally are very useful for making business decisions. Stock Summary displays everything about stocks in Tally in one single screen. Stock Management is one of the core functions of business and Tally handles it beautifully. Ratio Analysis will show you important ratios and account balances in Tally for taking vital business decisions. All major ratios and account balances are displayed in Ratio Analysis. Again, I have not written any post because this video doesn’t require writing any post. I hv few tips/ideas in Tally & can I share with my thoughts. You can share your thoughts here in comments or you can email me at rishit@tallyschool.com. You can email me. That would be better. Hey there ! I want to complete tally course online. But , can I afford a certificate by completing this tallyschool course ? I don’t issue certificates for this Free Course. Thanks Riddhi for your suggestion. There are PDF manuals which are provided by Tally Solutions itself. You do a simple Google search for any topic and you will find it. Can I make Invoice as per my format in Tally and print. Can I upload excel file in Tally.My knowledge of Tally is almost zero. You can create invoice in Tally as per Tally’s format only. At the most you can insert your company’s logo. You can upload excel file in Tally, but you have to purchase an addon for it. Currently Tally only supports .xml files. Hi RISHIT, Nice blog brother. Thanks for your nice comment Abhijit! For creating a sales invoice with transportation or freight charges, you will have to enter the information about sales invoice and after when you move down you will get an option of entering charges and discounts. There you can enter transportation or freight charges. You can learn Tally thoroughly and completely here on TallySchool. Thank you for your interest in Tally. I am currently creating a full fledged Tally Course which I will be launching in a few days. You can then have all the remaining videos. Hi..I am asmita …from science background but want to learn tally..I joined a class 3 days back ,but still very much confused with the words..like ledgers….journals…purchase ..commission…even i am getting confused with those three “Golden Rules “also. PLZ HELP. I would recommend you asking to a friend of yours who is in a commerce field to explain you things such as ledgers, journals etc. Or you can Google it and you will find good explanation. The Golden Rules are nothing but common sense. You can search for that on Google too. You can start learning Tally from here. Thank you very much Wajid for your kind words. I haven’t yet made a video on Invoice, but it is on my todo list. When you pass a sales entry (sales voucher), press Alt+E and that is your invoice. wanted to know if I need any knowledge in accounting to use tally. Knowledge of accounting is a must for learning Tally. At least basic accounting knowledge is required. i want to learn a tally, but my background is arts so that how i can do that? I recommend that you first learn some basic accounting because Tally is all about accounting. Then you start learning Tally and it will be much easier for you to learn Tally. hi wil u plz send me all diffrnt types of transaction used in tally. What kind of transactions are you looking for? I’m a teacher who teach Programming Languages such as C, Excel VBA Macro, SQL etc and would like to teach Tally as well. I’m from a Commerce Background. Have gone through your videos which are awesome and very simple to understand. Any idea, when are you going to upload the remaining videos. It would be great help to all of us buddy !! Thank you for being so self-less and God Bless you. Thank you very much Aboobacker! You can create inventory for manufacturing in inventory vouchers. The left side will be Manufacturing and the right side will be Manufactured Product. thanks for creating a such a helpful blog.i watch ur all videos bro u work nice job boss. I am so proud of your lesson bro. Could u please do me a favour by sending video tutorial thru my e-mail bro? I am already sending lessons on Tally. Just sign up on this above. Hi bro ! Good job. But I want to learn tally with vat entries and vat finalization at quarter. Please help me. Thanx and keep it up ! For VAT entries and VAT Finalization, you need to purchase the Tally DVD Course. I need to learn manual of tally suggest me how is it possible to learn in few time’s, because I am private company employ. I don’t know any manual in Tally. But you can go for TallySchool’s DVD Course if you want to learn Tally fast. As I have said to all the others, I am telling that to you too Haseena! Start with Free Tally Course Online! rakesh if u want to learn manual then read 11 class book u may learn. Start with Free Tally Course first. Once you are done with that, you can go with TallySchool’s Tally DVD Course! Please help me out about the transaction recorded in tally as stock item (maintaining detailed inventory) and later on want to capitalize some no. of inventory of that item. Create a ledger for Fixed Assets for the capitalization. Create another ledger under Current Assets. This ledger will be used for transferring stock to Fixed Assets. When you will come on current account, you will be asked to enter the inventory items. Enter it as per your requirements and you are done. How to retrieve data after creating a multiple companies? Means How I have seen my company info when entered information for creating a new company? Thanks in advance. It’s really very helpful for me to learn though I am a Computer Science Graduate. From what you have written, you mean that you want to see the data once again which you have entered while creating the company. Then press Enter on Alter and select the company. You are done. This is it. You can start with the Free Tally Course Online. After that you can buy the Tally DVD Course in which I have explained everything about Tally in detail. It is possible to maintain purchase and sale transactions even in foreign currency. You can have a look at this video for learning to enter purchase and sale transactions in Tally. U should have a dedicated video only on stock markets and investments in Tally school. I’ve already created dedicated videos on stock markets and investments in Tally here. How to make bank fixed deposit entries in Tally. For e.g., Rs 50000 deposited for 5 years at 7.5% interest rate and TDS at 10%. Additional 21% to be paid via Income Tax challan. What you are asking is pure accounting. Let me divide the entry in parts for better understanding. Firstly pass an entry for FD. Then, pass an entry for interest. Then, deduct the TDS from interest. Lastly, pass an entry for income tax payment. Hi .. I want to learn Tally for doing my accounts of every individual in my family. And after learning tally do we need to purchase Tally officially or free software is available for doing normal accounting like making final balance sheet and submitting return. Pls reply. You can learn Tally here to its full potential and not just for accounting of individual but also for companies and other entities. Yes, you have to purchase Tally for doing accounting of anyone. which step is the final lesson to prove that someone is tally qualified scholar and which step is the beginning for non accounting scholars. thank for your great tutorials. There is no final step in learning Tally. I am still learning it everyday. For beginning, you can start with Free Tally Course on this page. And, thank you for your good words. You can start with Free Tally Course above. You can download Tally (educational version) for free here on TallySchool. I WANTED TO KNOW ABOUT DEPRECIATION AND OTHER PROVISION ENTRIES IN TALLY.ALSO I WANTED TO KNOW CAN I GET A CERTIFICATE OF IT.IT WILL HELP ME FOR CA EXAM. Depreciation and other provision entries are simple journal entries. Also, a certificate will not help you in CA exams. what is the difference between marg.erc and tally.erc and which is better to learn. I have not used Marg so I cannot comment on that. What do you want to learn about interest calculations? Aisa tumhe lag raha kyuki tumne jo course kiya wo thik nahi ha ya to tumne course thik se nahi kiya ha! Hope to learn tally from the way you are suggesting otherwise it is little bit difficult. I am sure you will learn Tally with the easiest way possible very soon. What you need to do is to select Educational version from that screen. That way you will be able to use Tally for free. Hi, Rishit. I am using latest version of Tally9, version 5.1., in educational mode. Theres is different in your videos and what’s on my system. Is it due to version difference. For eg, while creating accounting voucher there is no credit or debit info as in your videos. That is because I have disabled single entry in Tally. You can do it under Configuration option from Gateway of Tally. Depreciation is related to accounting and not Tally. It is a simple non-cash expense. I learned tally but so how can I get certificate? Pls can you help me? You do not need any certificate in Tally, if you know know Tally. And, I do not issue any certificates. I will continue this without interruption. Your words are my inspiration! I will share my insights about payroll soon. I am from Arts , I want to learn tally please guide me, from where I have to start, please tell me easy way to learn tally asap. You can start with Free Accounting Course for basics of accounting. Then you can start with Free Tally Course here on TallySchool. Hello Rishit thanks for your supports. My last tally video was 8th lesson. After that didn’t get remaining videos. You can view all the lessons here on this link. You can start with the Free Tally Course for learning the basics of Tally. How to add opening balance in profit and loss account in tally? Carried forward amount from the last year is the opening balance in Profit and Loss account in Tally. You cannot add opening balance directly. You have to create a ledger which pertains to profit and loss account and then it will appear in the opening balance in profit and loss account in Tally. please give me under group examples in tally for Direct Income and Expenses and Indirect Income and Expenses. Direct/Indirect Incomes – professional income, brokerage income and so on. Direct/Indirect Expenses – professional charges, brokerage charges and so on. Yes, you need basic accounting knowledge to use Tally. You can start with the Basic Accounting Course here which is free. sir,i have some problems during the entery of accounting vouchers in tallyerp9 infact,when i entered some particular persons a/c’s eg. Ram’s A/c then then keep pressing the enter key and at last point a dialogue box appears suddenly which shows that proper reference name is not given for Ram. After that i tried many times to solve it,but in vain. Sir,please suggest a right method to solve this problem and the reason behind its occurence. Can you please tell me what is the exact accounting entry and under which category is the Ram’s account? Now, the entry was sold goods to Ram worth Rs.1100 and I had entered it in the Sales Voucher as usual by pressing F8 key. The Ram was debited to the Sales A/c. I put Ram under the sundry debitors group.Sir,I have noticed that when I put some particular persons name in an entery then, this problem occurs. hi, i have stock item with vat of 5.5% and 14.5%, i want invoice with multiple vat rate..
its giving me output 5.5% and 14.5% on total amout i want it item based? can u help me with that..
You can do easily what you have asked in Tally. But for learning taxation, you need to buy the Tally Expert DVD. ek question hu jaise company me dete hai or usko step by karna…for all things. ek hi question ka different work.. karna….please sir. Whatever the question aapka hai, usko aap Tally me solve karne me try karo. Jaise maine sikhaya ha waise solve karo or apko javab mil jayega. No, I don’t issue any certificates now. But if I shall issue in the future, I’ll let you know. I’ve completed B.com. I learned basic computer course 2 years before then I discontinued the course for some personal reasons. Now I want to learn tally and I want to become an expert in that. I hope you will assist for this. And also I’m looking for government jobs in accounting profile. Sir one more thing can I get complete course book as a soft copy to my mail inbox??? Start from the Free Tally Course. After that you can get expert from learning Tally from the DVD. If you have subscribed to the TallySchool Newsletter you will get the email for the whole Free course daily. Please go through the course on this page and you will learn all of that. By, the way Trial Balance, Profit and Loss Account and Balance Sheet are created automatically in Tally. sir, i am tax advocate, i want to use the tally for gst, but i could not understand, how i create a a number of clients in tally, makes the record of my different clients of differnt business entity, in ur tutorial this information is not clear,i thought it is only fot single business entity. kindly clear me. Firstly, GST functions are not yet available in Tally for India. And, you can create as many companies you want as per different clients. Here is the post which will explain how to create a company. Hello sir,i want to learn tally ERP 9 in easiest way.Can you help me. You can start by the Free Tally Course. please information tally in bachat gat in software tally additional . I am not understanding what you have written. Very nice Mr. Rishit .thanks for your contribution. i have one request, as you posted tally/accounting course in video format ,every time playing video is not very easy with slow internet speed, in this regard if u provide hole course in downloadable pdf format then it will help many of them. Thank you for requesting it. I will soon make available everything in the PDF format. It is already listed in menu. I am a retired Bank Employee. I want to join a company as an employee for additional income apart from my pension. I want to know whether I could learn Tally & ERP-9 very easily from this school. I know that most of the companies at present requires Tally and ERP-9 for the accountant posts. I am a B.Sc. (Maths) and M.B.M. (Master of Bank Management) graduate apart from my Bank employment. Thank you for sharing your concern with me. 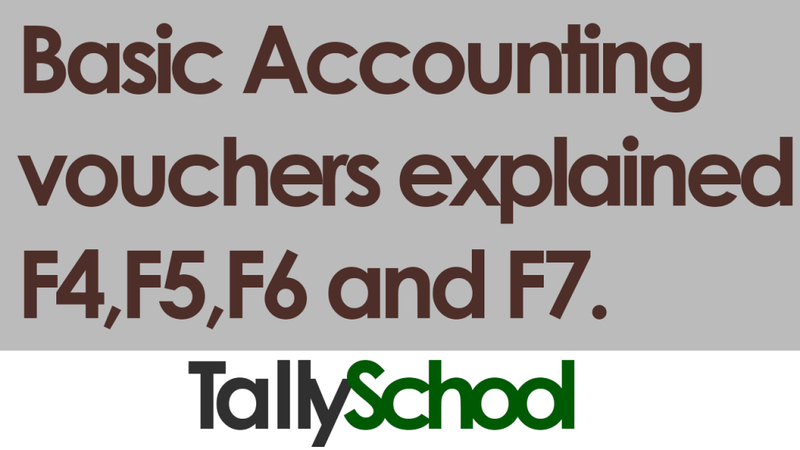 If you know accounting, Tally is very easy for you to learn because then you will only need to understand the functions. in my business bill containing two discount first is primary scheme discount and second is vat discount. You can create a ledger named Dis 1 and Dis 2 under direct expenses. Then, if you would enter a voucher, you will see the discount columns. Amazing work done by you Rishit Shah….. Thankyou for the tutorials… Hoping to see advanced videos also. I will post some advanced videos too. i had learned of something abt tally because of u Thanks for that there r 12 lessons what about the rest is that all over..or still remaining.. There are 12 lessons and after that there is an advanced DVD course. I’m working in finance company mutual fund can you tell me how to pass the entry in tally on behalf mutual fund.we provide services and AMC give us brokerage. You need to pass simple sales and income entries for providing services and the brokerage you receive respectively. Do you know, How can I get data to practice tally all features? I have not enough data to practice deeply. So please help.I want data backup to use all tally features deeply. The best way to practice is to take all the bills in your house and start entering them in Tally. Do your own accounting in Tally. Do your friend’s and family member’s accounting for free. No one will deny that. You will have much more experience than most of the people. sir please ans. me in POS invoice amount is Rs. 9800 payment paid by customer for exm. my question is this balance rs 200 is effective in balance sheet ( yes / no) and explain about this balance . If you keep ₹200, than it will show in Balance Sheet as a Liability. You can account that as extra income. If you pay the customer, then there will be nothing in the balance sheet. for each . how i enter in tally . i want to enter the total amout of each daily . how ? You can pass an entry for sales for each customer by creating a sales entry or you can pass entry computer wise at the end of the day. That is a difficult problem. I can understand it. there is a difference in my tally version nd your tally version nd dats creating a diificulty for me…. COULD U PLZ HPL ME OUT? Installation and running of Tally are almost same in any version of Tally.ERP 9. What difficulty are you facing? I can solve it. I’m totally new to tally & I want learn it through online course by you. But I’ve noticed that toutorial videos are for older version of tally which is not GST ready. As the new GST ready version 6.0.0 is released now I want to learn the latest of tally. So please tell me if the new version is totally different from the old one or just minor changes. Are you going to release some new video about 6.0.0 or A whole new course. Please tell me should I start with old videos or wait for new videos by you. Please reply soon… Thanks in advance. There is only one major change for GST ready version and that is GST. All other functions are the same. So, if you want to learn Tally, you can watch all my tutorials are they are completely same as the new version 6.0. I will be releasing tutorials related to GST in this month. I will also be releasing the course on GST in Tally. After you create a company, it will open up automatically and you will be in that company. If you want to switch companies, you can press ALT+F1 from Gateway of Tally. It is almost same as the stock market entries. I will release it by the end of this month. I have already uploaded the 4th video. Hi, I’m inspired by your tutorials and i want to learn TALLY. but i couldnt subscribe to tally school as i didnt get any confirmation mail (checked in spams too). why so? Please let us know once it’s sorted. Thank you! Basically am from science group. I have completed B.Sc(Comp. Sci). am fully new to accounts subject. But now interested to learn accounts because of its opportunities.. my current job maintaining sales register, purchase register, bank book, stock book all are in manual written work. Can i promote myself as accountant?? please kindly guide me to know an survive in the field.. now am almost learnt tally also.. but am feared about BRS, TDS, online return filing.. kindly help me sir..
You can learn BRS, TDS and online return filing by experience only. Get the work in your job and learn it. Also, I will be preparing new accounting course and will let you know once it is done. Thank you sir. thank you for teaching tally by step by step lessons. I am happy that you learned Tally. You are always welcome at TallySchool. Hi sir Good evening, plz tell how to buy full cource of tally and tally for GSTthrough CD and how much it will cost. I am preparing it and I will let you know when I will release it. 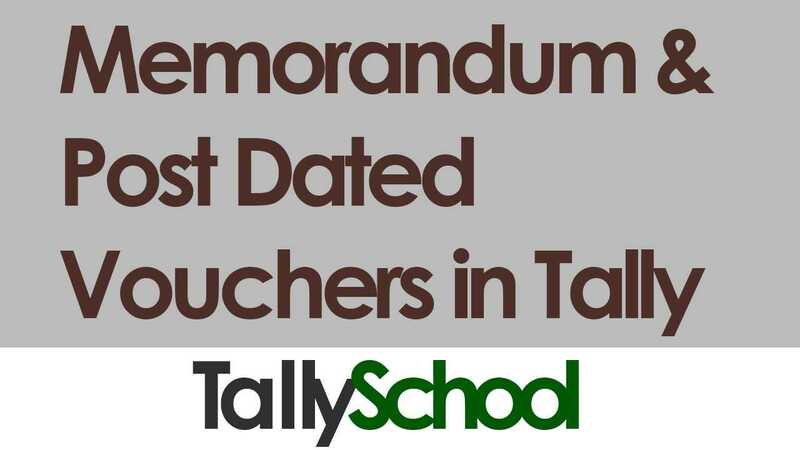 what is need to create voucher in tally? Vouchers are in simple terms accounting entries. They are created to record transactions in accounting. For example, if you purchase a chocolate, you will pass a purchase voucher which in simple terms is called purchase entry. What kind of books entry? You can learn basics of accounts with my Free Basic Accounting Course on TallySchool. I am not providing any certificate because it is free course. I don’t know the VAT laws of UAE, so I can’t advise on that you. I can give my explanation regarding accounting and Tally and Indian laws relating accounting and taxation. very complete material for beginners. Did we get free certificate without any fee? I am sorry! I don’t issue free certificates. Will i get a certificate after learning tally from here? Yes, you will get a certificate after you pass the test which I will be putting online soon. It will be free. how can i get certificate. I am setting up the test which will be live soon and with that you can also get the certificate. It will take just a few more days. We are getting supplies from single vendor from 3 different states i.e.3 different GSTIN. Is it possible to have 1 Acctg ledger for the party with different GSTIN. Meanwhile wish you good luck for your hard work. No, it is not possible for a single accounting ledger to have different GSTIN in Tally. What you can do is create 3 different ledgers with the same name with added state names. hi sir, am new to accounting. please help me sir. this 1 lakh + 4000 = 104000. ) wrong transaction. please give ur valuable support for me sir..
You can do one thing. You can create a Purchase Voucher instead of Journal Voucher. While adding brokerage and discount, make sure you write the amount as -1000 and -3000. Make sure you put the minus sign for discounts and brokerage. This way, it will not add up. Sir when will you post the test for certification purpose? I have posted the test for the certification. 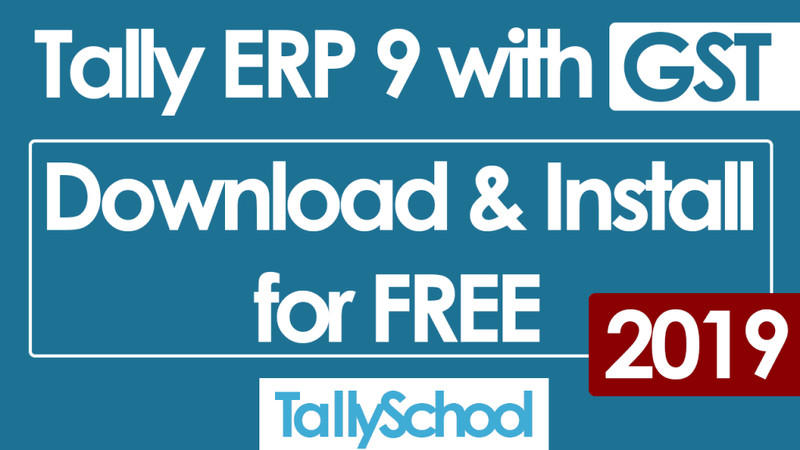 You can upgrade Tally 9 to Tally.ERP 9. Download the latest version of Tally and install it. That’s it. Everything else will be taken care by the software. For safety, take a full backup before upgrading. Please confirm your email. I have sent you a new email. You can give the exam by going through the Exam Email you received. Just press ALT+W or select Educational Mode when Tally asks for license details. I have already done it. It is called Post Dated Vouchers. Im facing a problem. While creating purchase ledger the cursor dose not move to the ‘statutory information’. Instead skipps all the fields under ‘statutory information’ and on pressing tab/enter key it moves to the right hand side part of page skipped ‘statutory information’. Plz help. Do i need to enable some feature under F11? You need to enable GST in F11 which is the Feature menu in Tally. You have to go to F11 > Statutory & Taxation > Enable GST and you are done. For learning how to enable and set GST – here is the link to the GST Course on Tally. Please provide me school accounting related notes. School related accounting notes are almost similar to normal accounting notes. If you want to learn anything specific, please let me know? I used tally in head office but in my branch office i don’t have tally. Please tell me that how to use online tally? For using online Tally, you need to set up TSS which is Tally Software Services. Hi Rishit Shah, I liked your way of explaining. And I learned a lot from your tutorial. But I couldn’t find any post regarding payroll. Could you help me with this? I am currently in the process of publishing new posts and videos which will include payroll as well. They will be published soon. I have seen one of your video regarding How we accept fee from student and how we maintain the record of the deposit and pending fee of the student. It was really very nice. As this can you please send the link of the article regarding how we distribute salary of the employee and maintain the record of the salary to whom we give or also maintain the record to whom we still not give salary. Thanks. The question that you are asking is about payroll. I will soon be publishing posts and videos about payroll in tally. That will solve all your questions regarding employee fee payments and distribution.